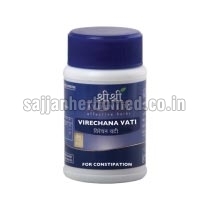 We are offering Virechana Vati Tablets which are a proprietary medicine aimed to relieve the common problem of constipation. Procured from the reliable manufacturers, our Virechana Vati Tablets are known for high efficacy and zero-side effects. The laxative property of Virechana Vati helps in the easy passage of bowels and also clears the stools. These tablets are a unique formulation of natural ingredients such as Bala Haritaki, Trivrt and Eranda Taila. They are also indicated in Anaha, Adhmana, Udara shoola (Collic), Arsha (Piles / Ano - rectal growths), Shwasa (Dyspnoea), Kasa (Cough), Krimi (Worm infestation) and Kushta (Skin disorders). Virechana Vati Tablets come in a pack of 60 tablets. Indications : The laxative property of Virechana Vati helps in the easy passage of bowels and also clears the stools. It is indicated in Constipation, Flatulence, Distension of abdomen due to obstruction to passage of urine and stools, Colic, Piles, Jaundice, Cough, Hiccup, Worms, Oedema, Urinary disorder, Skin disorder. Dosage : 2-4 Tablets to be taken in night with water.